Spend Too Much Time on Email? - Lucrum Consulting, Inc.
Home Blog Spend Too Much Time on Email? Spend Too Much Time on Email? Almost everyone feels as though they spend too much time on email – the Lucrum team included. 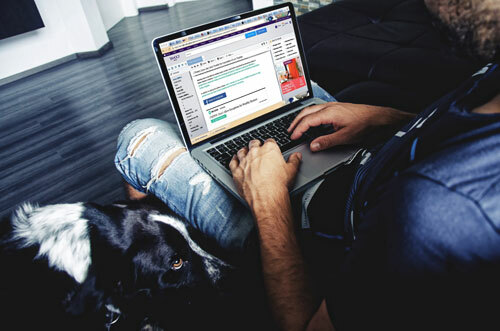 That’s why we’ve compiled the following seven tips to help employees across the region be as productive as possible when it comes to handling email. Sending a lot of the same emails to clients? Add them to an email list management software such as Constant Contact or MailChimp. These tools allow users to automate series of emails using the autoresponder function. Another way to automate emails is to set up inbox rules so certain emails are automatically filed into the folders that have been set up. For example, monthly emails for a recurring bill payment could be sent straight to a bills folder if it doesn’t need to be read immediately. This will save time in the morning while sorting through the pile of email that was sent overnight. Make a habit of checking email only once or twice in the day. Plan those times on a calendar and set a timer to stop if needed. This employs time batching, one of the most productive ideas in time management. It’s unproductive to stop and read each email exactly as it arrives, so setting designated times helps individuals better work with email. Draft email responses to the top 10 most asked questions. Get a lot of the same questions over and over again in email? Don’t start drafting a response from scratch each time. Start with a draft of a previous answer, make it generic and save it in the drafts folder. That way, when that question is received again, simply copy and paste the draft and customize it as necessary. Repeat this for the top 10 most-asked questions or emails that are sent on a daily basis. This practice will shave minutes off each email reply from now on. Learn the email software being used. Sure, everyone pretty much knows how to send, reply to and forward emails. Most even know how to add attachments. But what else is used on a regular basis? Tech savvy users should spend some time reviewing their email settings and functions. There may be some resources available that will make the days easier to tackle. For those individuals who are not comfortable with all things technical, sign up for a formal course, preferably in person, where a real, human teacher can answer any questions. It will be a day well spent. Folders, labels or categories in email software are all good ways to segment email so it can be processed in a particular order. Folder titles might be by priority, client, service type or something else. In any case, it’s easier on the brain to answer all questions from one client or topic at a time than it is to ping-pong back and forth. Use folders to save a completed email for future reference. That way, the inbox stays clean and empty. Use the email software’s search function liberally when needing to find an old email. This will save tons of time. Get a new email address if your current email address is too spammy. Losing the spam battle with an email address that has been used for more than a few years or that has been hacked? If so, the best solution might just be to switch to a new email. Choose a good email address in the first place by staying away from email addresses that hackers can guess, such as webmaster@yourdomain.com, sales@yourdomain.com, or info@yourdomain.com. Instead use service@yourdomain.com or a first and last name version. Need help becoming more efficient with how you reply to and process email? Call 704.927.0462 and let Lucrum Consulting show you how these productivity tips can help you spend less time on email while still getting the job done.